Ronald Westcott: Arsenal’s unluckiest player ever of whom we know so little. Ronald (known as Ronnie) Wescott is a player who despite playing for Arsenal in the 1930s is a player whose entry here is going to be sadly very short, for he suffered a career ending injury in just his second game for Arsenal. He was born on 19 September 1910 at Wallesey in Cheshire and played initially for Banbury Spencer. I think Banbury Spencer was actually “Spencer Sports Club” which was formed in 1931 as part of a recreational and social organisation tied a local company. By 1934/5 they had risen through the leagues to the local senior league. In the 1960s it mutated into, or merged into Banbury United. One news item I located says that on 5 November 1935 Arsenal signed as a professional “Ronnie Westcott, a centre forward from Banbury Spencer, the Oxfordshire amateur club, which competes in the Birmingham Combination. Westcott, who is 22 years of age, 5ft. 11in. high, and weighs 11st. 12lb”. But Ronald Westcott’s two appearances and one goal in 1935/6 were the total of his first team appearances for Arsenal. He was indeed seen as a promising player but he was injured in the knee in his second game, and never played again, and thus retired at the age of 26. His brother Dennis was also a footballer and was the league’s top scorer in 1946/7. That is, I know, a very modest account of an Arsenal player of the 1930s, but it is all I can find out. If you have anything else at all on Ronnie, including what else he did after leaving Arsenal, and indeed the date of his death so that we may record that too, I would be very grateful to receive it. 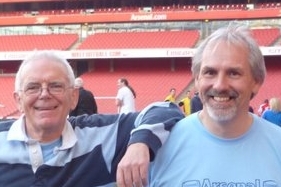 9 comments to Ronald Westcott: Arsenal’s unluckiest player ever of whom we know so little. Not much to add except Ronnie was one of eleven children 2 girls and 9 boys. My father’s brother married one of the Girls Winifred. As a child i was told about the family all of whom were sporty no fewer than 5 of the boys played professional football including Ronnie and Dennis but my aunt recalled the best footballer of all was in the army and never played professionally. My father told me of Ronnie but until now had found no reference to him, i can see why as his career with Arsenal was so short. Thanks for getting in touch Neil. Do appreciate it. I met Ronnie Westcott’s son – also Ron – whilst working for the Revenue ( now HMRC), he was goalie for Carshalton. Not a lot of use I know, but an “interesting fact”. Ron was District Inspector of Croydon 4 (or 5) as I remember. Every extra fact is helpful John. Many thanks. Ron’s younger brother Dennis scored 105 goals in 128 league appearances for Wolves from 1937-48. In 1938-39 he won an FA Cup runners-up medal and scored 43 goals, a record broken by Steve Bull 50 years later. On 7 December 1946 Dennis scored four in the first half of a 5-1 Wolves win at Anfield – the last player before Andrey Arshavin to score four away to Liverpool. That same year he was one of the first players subject to Wolves manager Major Frank Buckley’s bizarre “monkey gland” injections. From 1948-53 he scored prolifically for Blackburn, Manchester City and Chesterfield. Is this the Westcott who played for England against Wales at Wembley on 27 February 1943? No first name is given in the Daily Herald account of the match in 1 March 1943. It was Dennis Westcott who made four war time appearances for England and scored five goals including a hat-trick in that match against Wales. He never achieved a full international cap in peacetime. He did however play for the Football League in an inter league representative match. This information from ‘Forgotten Caps’ England Football Internationals of Two World Wars by Bryan Horsnell & Douglas Lamming. His brother Ronnie of Arsenal according to ‘Who’s Who of Arsenal’ by Tony Matthews died in Cheshire,c.1987. Ron Wescott and my father, Robert Ritchie, won many trophies at the Royal Blackheath golf club. In later life he went into silver. He retired to Vancouver, B.C. I can’t recall when he died.